While it was previously rumoured that the Xiaomi Mi MIX 2S will come with a notch on the upper-right corner for a selfie camera, Xiaomi has now confirmed that the upcoming smartphone will not feature a front-facing camera on top – unlike many other Chinese offerings. The company on Monday released some teasers of the Mi MIX 2S that confirm the absence of the awkward notch. The teasers also showcase the front view of the new handset that appears to be similar to its predecessor. Separately, Xiaomi CEO Lei Jun revealed free round trips to Paris for select guests attending the Mi MIX 2S launch on March 27. 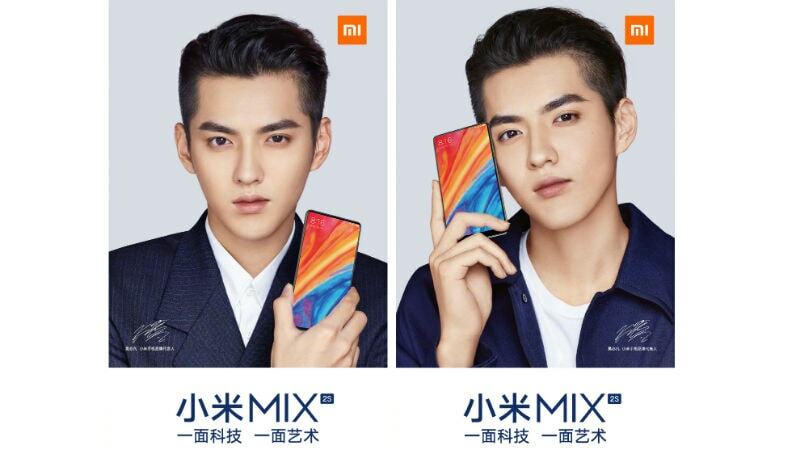 As per the teaser images, which are posted on Weibo, has roped Chinese-Canadian celebrity Kris Wu as the brand ambassador for the Mi MIX 2S launch. The images show Wu holding the Mi MIX 2S. If we take a closer look at the images, these reveal the near-bezel-less display – with no room for a top-side selfie camera. This counters the initial set of leaked images. At the same time, the absence of the top notch for the selfie camera suggests that the Mi MIX 2S will have a front panel similar to the last year’s Mi MIX 2. We presume that the Mi MIX 2S will come with a front-facing camera on the bottom bezel that appears to have enough space for a sensor. However, if this would be the design, the Mi MIX 2S will likely to force you to take selfies in a landscape mode (vertically) instead of a portrait mode. Some Mi MIX 2 users complained about this odd experience in the past. Alongside the release of the Mi MIX 2S teasers, CEO Jun on Weibo announced that 10 guests attending the smartphone launch will get free round trips to Paris to visit Centre Pompidou in France by Xiaomi. The modern art museum, which is the largest in Europe, will host the Xiaomi Mi MIX 2S as well as the Mi MIX 2 and the original Mi MIX. According to some ongoing rumours, the Xiaomi Mi MIX 2S will feature a 5.99-inch display, 12-megapixel dual rear camera setup, Snapdragon 845 SoC, and a 4400mAh battery. It is also expected to include wireless charging support and might come with an under-display fingerprint sensor. A leaked image of stickers for the retail boxes of the Mi MIX 2S points at 8GB of RAM and 256GB of onboard storage. Furthermore, previous teasers suggested AI camera features, enhanced slow-mo mode with 4K video recording support, and faster autofocus experience than the previous Mi MIX models. Indeed, we need to wait for some more days to get all the official details about the Mi MIX 2S.